By the end of 1985, Latin Americans owed their foreign creditors $368 billion. That was nearly $1,000 for every man, woman, and child between the Rio Grande and Tierra del Fuego. The debt represented more than half of the region's gross domestic product, and interest payments alone consumed 36 percent of export revenues. If profits are added to interest, and the total compared to new capital inflows, the drama of the situation becomes clear: a real resource transfer from Latin American was under way. More than three-fourths of Latin America's debt was owed to several hundred commercial banks with headquarters in North America, Europe, and Japan. Banker to the Third World examines why the loans that precipitated the 1985 debt crisis were made, how these loans were similar to, and different from, other loans, what solutions to the crisis would be effective, and how such problems could be avoided in the future. 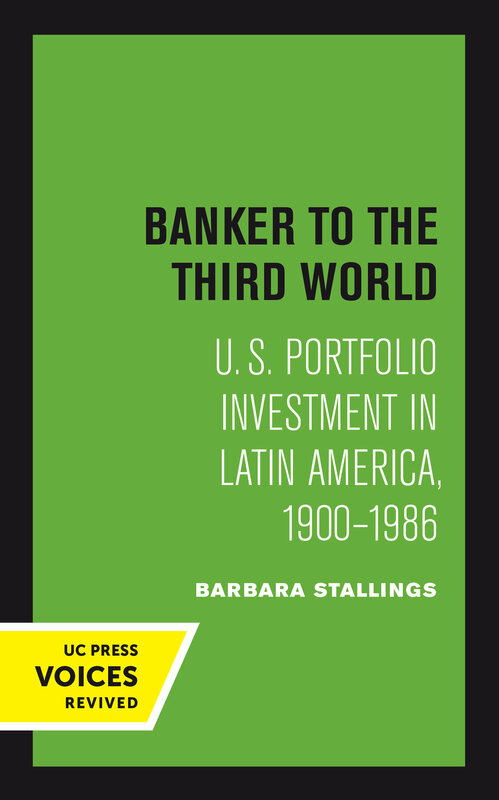 When originally published, this title presented a new and timely analysis of the crisis; today it serves as a historical exploration that will give readers a better understanding of both Latin American economic history and more recent foreign debt crises. This title is part of UC Press's Voices Revived program, which commemorates University of California Press’s mission to seek out and cultivate the brightest minds and give them voice, reach, and impact. Drawing on a backlist dating to 1893, Voices Revived makes high-quality, peer-reviewed scholarship accessible once again using print-on-demand technology. This title was originally published in 1987. Barbara Stallings is the William R. Rhodes Research Professor at the Watson Institute for International and Public Affairs at Brown University. She is also the editor of Studies in Comparative International Development.